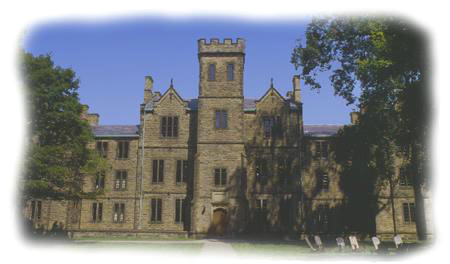 The Department of Religious Studies at Kenyon College, based in Ascension Hall (pictured above), approaches religion as a global and pluralistic phenomenon. We understand the study of religion as a crucial element in the larger study of culture and history. Our goals include helping students (1) to recognize and examine the important role of religion in history and the contemporary world; (2) to explore the wide variety of religious thought and a practice, past and present; (3) to develop methods for the academic study of particular religions and religion in comparative perspective; and (4) to contribute to the ongoing discussion of the nature of religion. Since the phenomena that we collectively call "religious" are so varied, it is appropriate that they be studied from a variety of theoretical perspectives and with a variety of methods. The diversity of areas of specialization and approaches to the study of religion among our faculty members ensures the representation of many viewpoints. Our courses investigate the place of religion in various cultures in light of social, political, philosophical, and psychological questions. We also encourage Religious Studies majors to take relevant courses in other departments, and our faculty members frequently team-teach with members of other departments. The curriculum mirrors the diversity of the faculty. We offer courses in Judaism, Christianity, Religions of the Americas, Islam, Buddhism, South Asian religions, and East Asian religions. Majors are required to take courses in at least four religious traditions. In our courses we emphasize work with primary sources, both textual and nontextual. To this end, students are encouraged to study relevant languages, and to spend at least part of their junior year abroad in an area of the world relevant to their particular interests. Our courses require no commitment to a particular faith. However, students of any background, secular or religious, can benefit from the personal questions of meaning and purpose that arise in every area of the subject. This website is maintained by Pamela Sheasby. Copyright © 2007 Kenyon College.